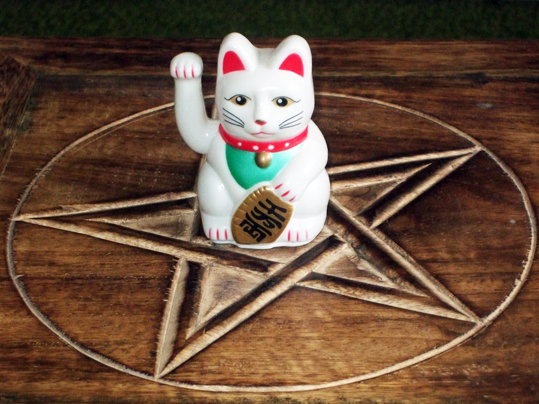 Here is a the Oriental lucky cat that I was given at Yule, on my altar for Chinese New Year. It is the start year of the rooster in 2017 - not the year of the cat. In fact, there is no cat in the Chinese Zodiac, although there is a year of the tiger. Back in the day when the Jade Emperor was still arranging the zodiac, he organised a race to decide which animals would have a year named after them. At that time, the cat and the rat were friends and the cat asked the rat to wake her up so they could both get to the start of the race together. However, the rat forgot. The cat overslept and, despite running as fast as she could, she reached the finish line long after the other animals. Since then, cats have chased rats whenever they see them. Actually, the real reason there is no year of the cat in Chinese astrology is that there were no domestic cats in China at the time the system was developed. I guess in some ways that means the cat was late for the heavenly race after all, but it had nothing to do with rats. The lucky cat with the waving hand actually originated in Japanese culture, but is popular in China too. On each Pagan Eye post, I show a photo that I find interesting, with a few words about it. It can be a seasonal image, a pagan site, an event, or just a pretty picture. In Vietnam, they don't have a Year of the Rabbit, they have a Year of the Cat! Thanks very much for mentioning that - I didn't know.